Après sa huitième défaite contre Tamawashi, l’ôzeki kadoban Kotoshogiku sera rétrogradé au rang de sekiwake au prochain tournoi en mars. L’ôzeki Kisenosato a franchi une étape importante vers son premier titre après sa victoire écrasante sur Ikioi conservant ainsi sa place de leader. 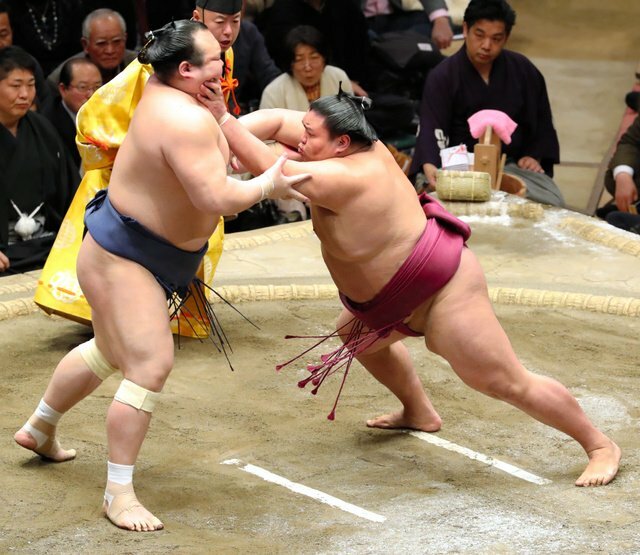 Ikioi a tout donné dans son combat mais Kisenosato a été puiser dans ses réserves d’énergie pour lui tenir tête. L’ôzeki a remporté tous les 14 matchs contre le maegashira. 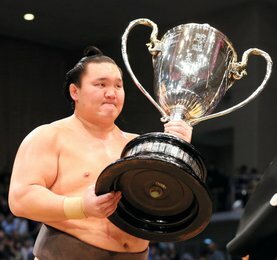 Le grand champion Hakuho et ses compatriotes mongols Ichinojo et Takanoiwa sont toujours second avec dix victoires. Hakuho a achevé la journée par un hikiotoshi sur le maegashira 4 Tochiozan qui est facilement tombé. Takanoiwa a conservé la place de second grâce à sa victoire sur Nishikigi en le frappant au visage au moment du tachiai puis en esquivant son adversaire pour enfin le guider vers la sortie. L’ancien sekiwake Ichinojo a été mis en danger dans son combat contre Hokutofuji mais le géant a réussi par se reprendre pour obtenir sa dixième victoire. Sokokurai a perdu une place et arrive troisième en subissant une nouvelle défaite contre Chiyoshoma. 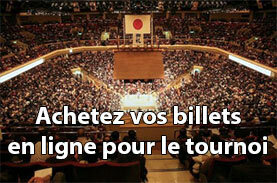 Mis à part pour Kisenosato, c’était une très mauvaise journée pour les ôzeki. Terunofuji a été condamné au make koshi après avoir été battu par le maegashira Takekaze. Goeido a également mordu la poussière dans le combat suivant quand il a été terrassé par le populaire Endo. L’ôzeki Kotoshogiku a été conduit vers une huitième défaite fatidique par Tamawashi. Make koshi pour la seconde fois consécutive, l’ôzeki sera rétrogradé au rang de sekiwake en mars prochain. Ozeki Kisenosato took another major step towards his first championship title with a win over Ikioi Thursday, keeping him in sole possession of the lead at the New Year Grand Sumo Tournament. 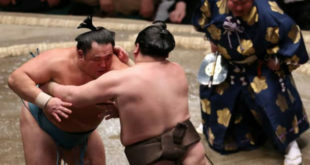 Looking to finally shed his tag as a nearly man after coming so close but failing to win the Emperor’s Cup on numerous occasions, Kisenosato (11-1) did not have it all his own way against the third-ranked maegashira at Ryogoku Kokugikan. Ikioi (7-5) put up a spirited effort but Kisenosato dug deep into his energy reserves and came up with the goods to improve to 14-0 against his opponent and remain one win clear with three days of the 15-day basho remaining. 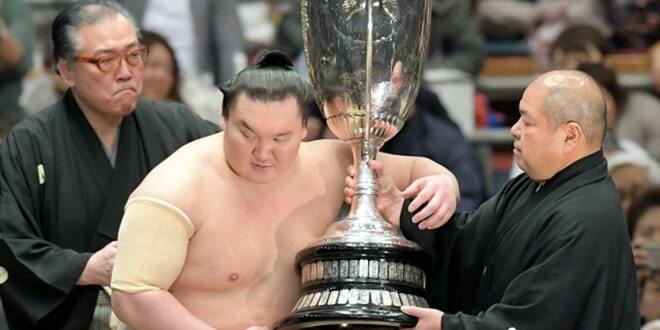 Grand champion Hakuho and fellow Mongolians Ichinojo and Takanoiwa stayed one win back at 10-2. 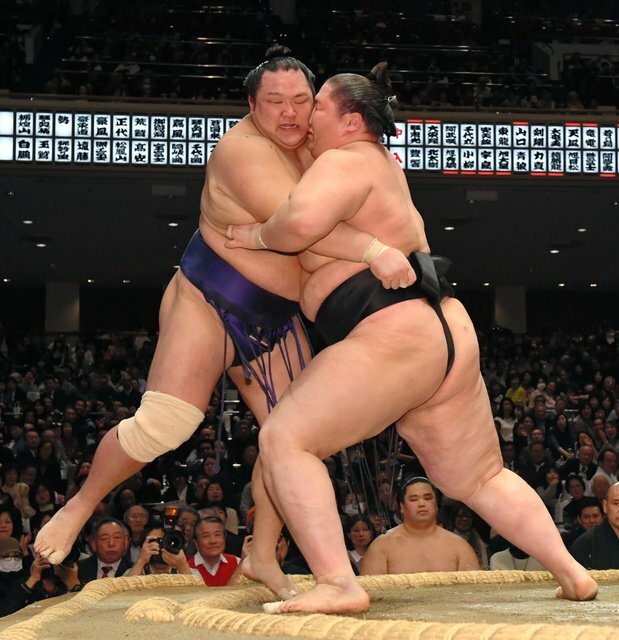 Hakuho, the most successful wrestler in sumo history with 37 career championship titles, wrapped up the day’s action with an easy hikiotoshi hand pull down against No. 4 maegashira Tochiozan (3-9). Takanoiwa stayed in touch with Kisenosato with a blood-and-thunder win over Nishikigi (4-8), smashing him in the face at the charge and then dodging the No. 11 maegashira’s swinging palm before forcing him over the bales. 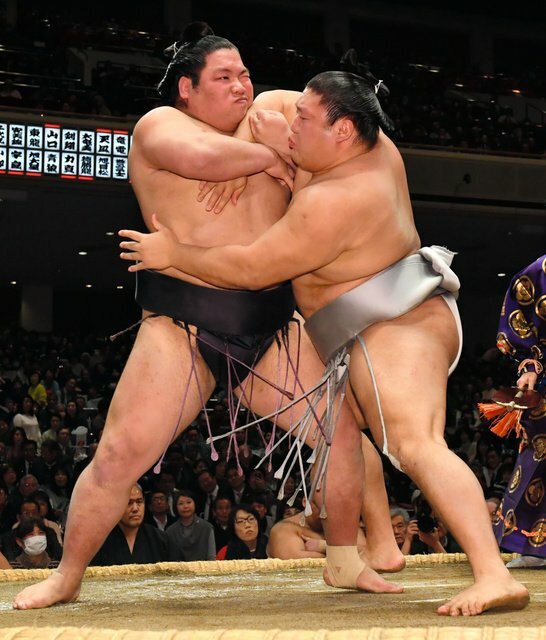 Thirteenth-ranked Ichinojo, a former sekiwake, got a fright in his bout against eighth-ranked Hokutofuji (8-4) but charged back from the ridge to belly him out for an ultimately comfortable win. But 10th-ranked Sokokurai (9-3) dropped out of the chasing pack as he was sent to his third defeat, sixth-ranked Chiyoshoma (6-6) putting the Chinese-born bruiser to the dirt with a pulling overarm throw. 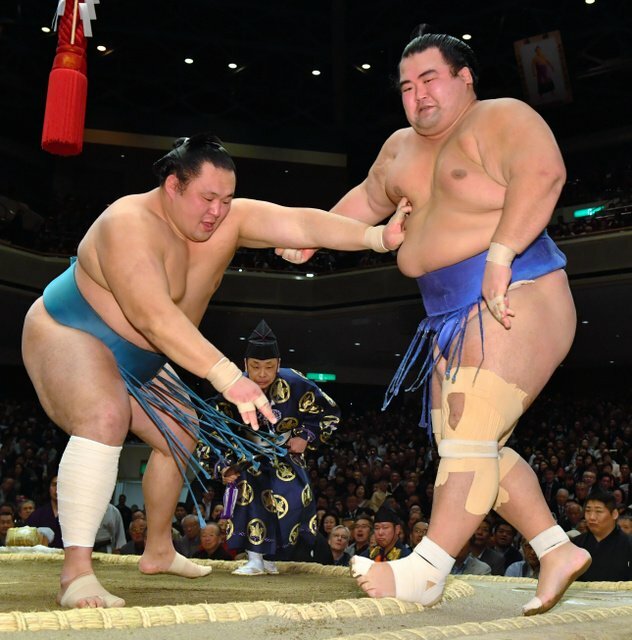 In other bouts, towering Mongolian ozeki Terunofuji was condemned to a majority of losses after being slapped down to an eighth defeat by fifth-ranked maegashira Takekaze (8-4). Goeido (8-4) then bit the dust in the following bout, the ozeki getting taken out by No. 4 maegashira Endo, who leveled his mark at 6-6. 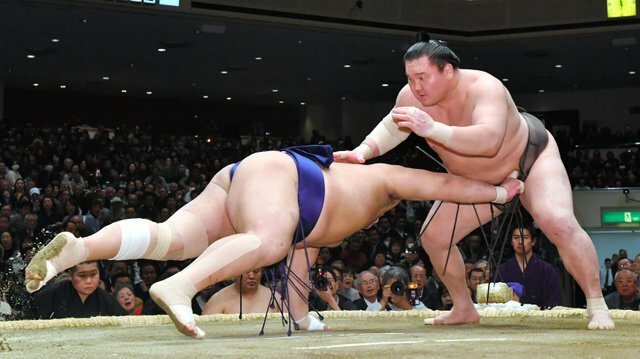 Kisenosato emerged as the only ozeki to survive unscathed as Kotoshogiku, surprise winner of this tournament in 2016, was barged out to a losing 4-8 record by sekiwake Tamawashi (7-5) in the day’s second-to-last bout. 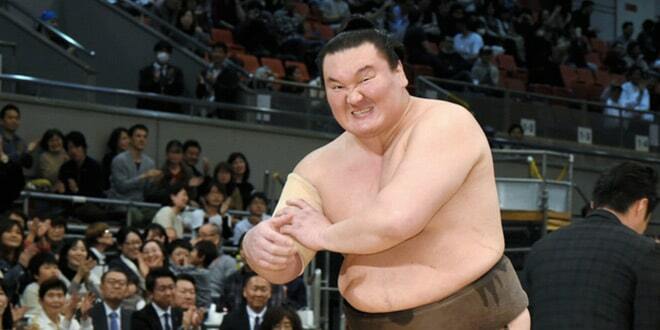 Kotoshogiku’s second straight losing mark means he will be demoted to sumo’s third rank of sekiwake for the Spring tournament in March.